Once dry the ties were ready for coloring. The white primer equalizes the color of the plastic and wooden ties so that they are able to be weathered and colored leaving no discernible difference between them. 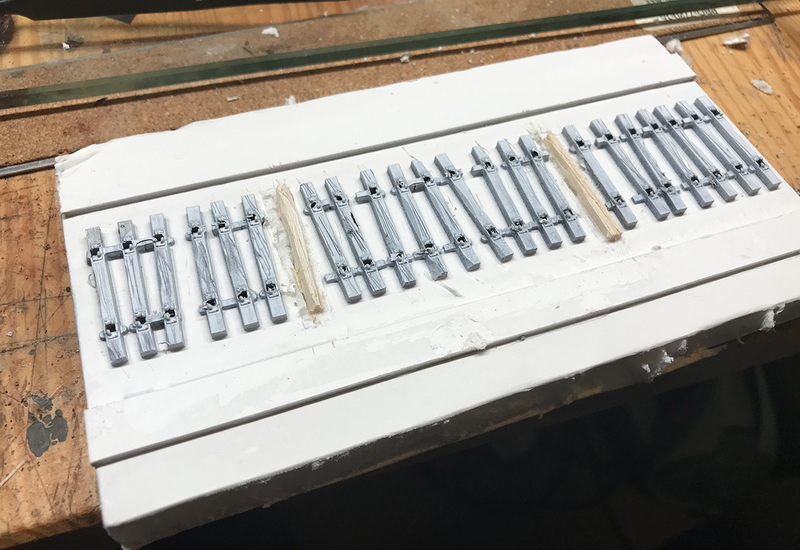 The paint will allow the various weathering methods to grip both the plastic and the wooden ties equally. The first layer of colors came from my Winsor Newton pigment markers. These markers have been a ‘game changer’ in my modeling. 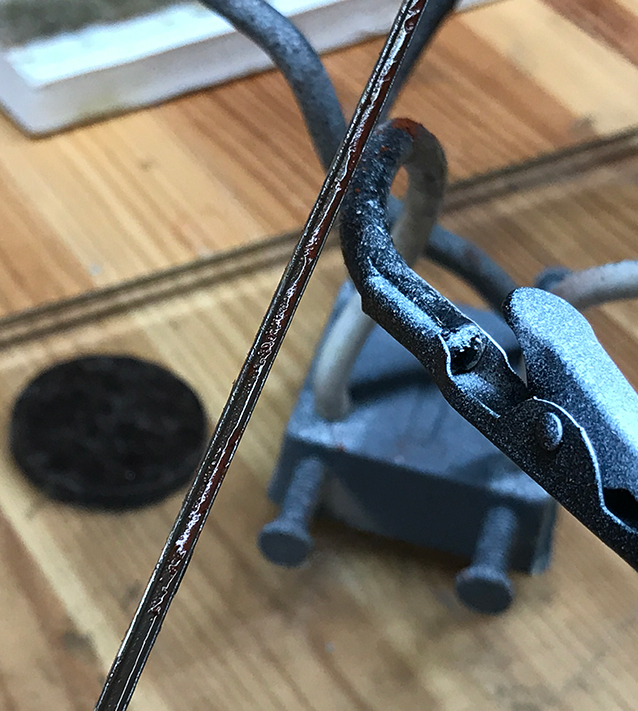 I was very dissatisfied with the Indian ink and alcohol method of wood staining as the colors ended up being very one dimensional – light grey – medium grey – dark grey – boring! These pigment markers lifted me out of monochrome hell and allowed me to enter a world of color and most importantly control – control over the effect – to make it as close to real weathering as possible. To be honest I’m still learning about staining effectively – I’ve seen amazing examples of wood weathering around the internet and I realize that I’m not even close to being able to do a great job. But it’s a start. Its the wide range of colors that makes these markers so invaluable. Also I was able to stain sections of wood in about 5 five minutes as opposed to 24 hours using the Indian ink method. I also have much more control over the coloring effect with less reliance on hope and crossed fingers at the end of a days staining! 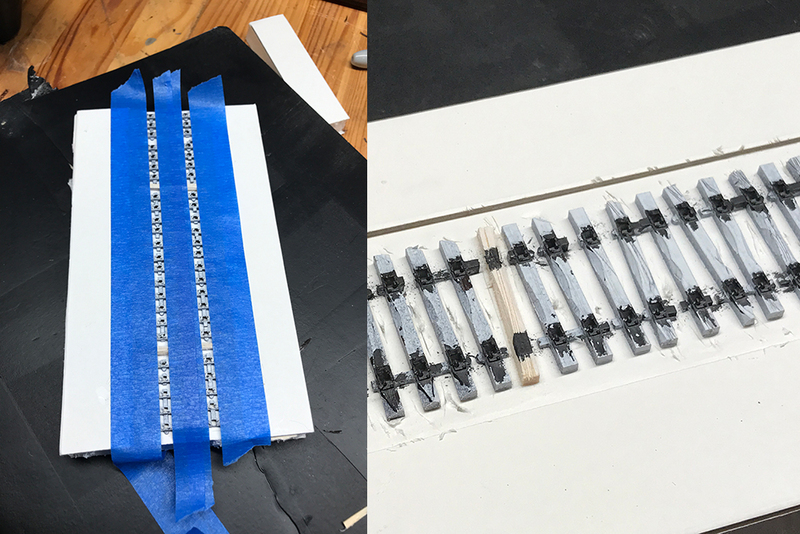 I started with the lightest grey possible and what I noticed was that the ties made from different materials (wood and plastic) started to blend together – making it harder to spot the differences between them. I went very carefully with color. 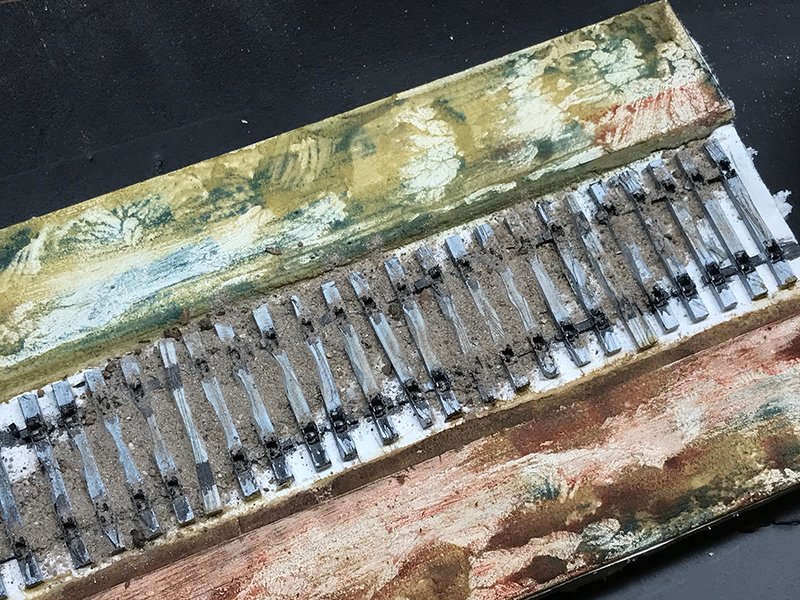 You really don’t need to do too much to begin with as later layers of chalk, paint and dirt from the ballast will add more and more colors to the ties. The color of the wooden ties is now more aligned with the plastic ties. I masked off the tie plates and painted them dark brown. A little paint crept under the tape but will eventually be hidden by various layers of dirt and weathering. 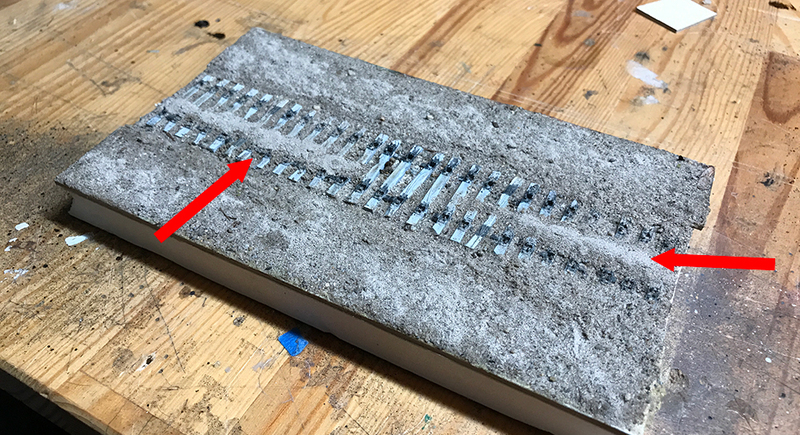 I really don’t like ballast – both on real track and model trackwork and I have tried to avoid using too much of it on my own trackwork. If I have to use it then I avoid the commercial model ballast sold by the likes of Woodland Scenics. That ballast color is much too brightly colored and plastic-looking for my tastes. 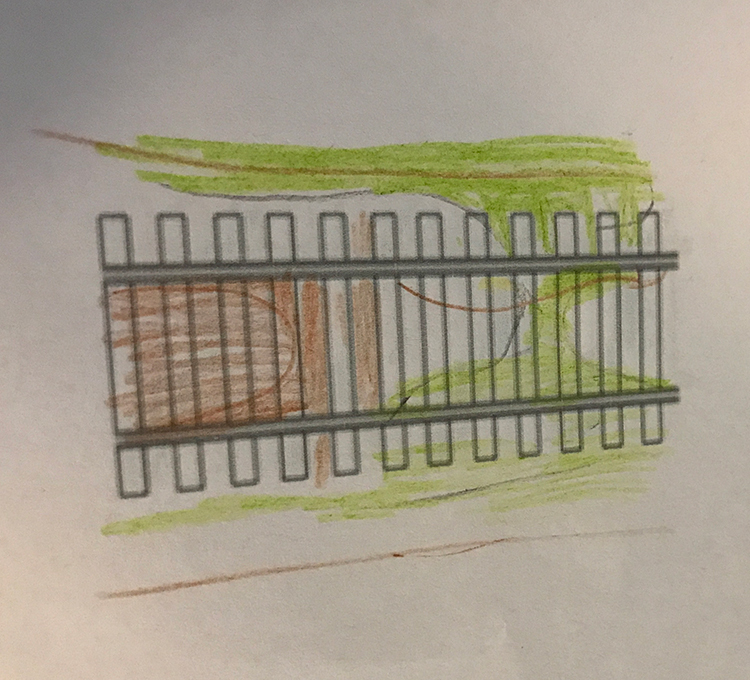 I have created my own ballast from a variety of natural sources which I feel is more to scale and has a nice variety of color and is not too bright. 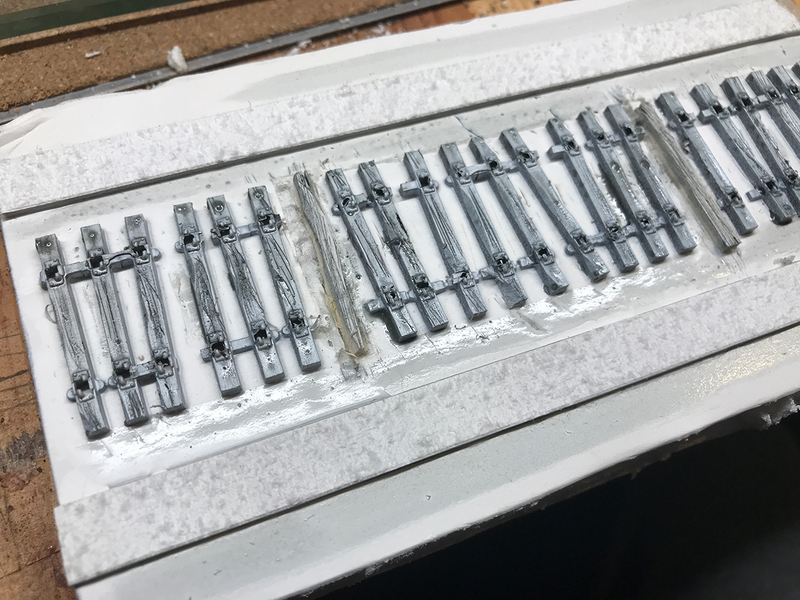 Of course one can always spray-paint commercial ballast but then you just have a single color effect – a long sweep of sprayed ballast. I wanted to avoid ballast if I could and just use dirt. 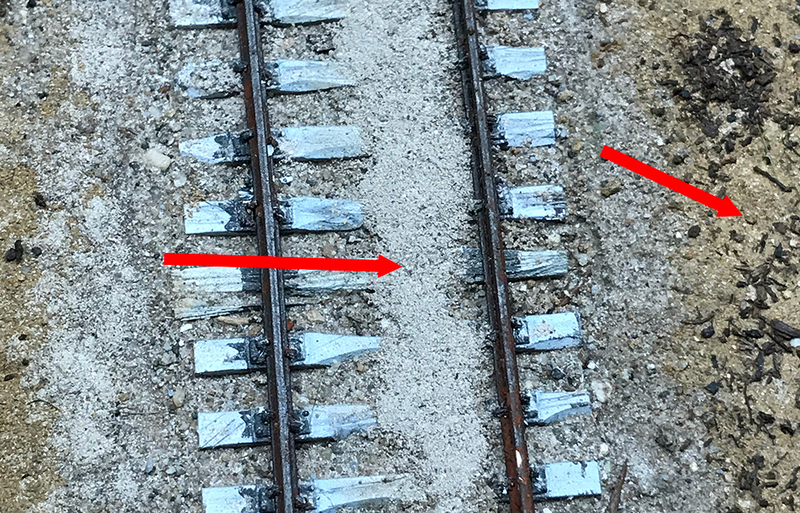 I used track ballast for the gravel. It was much too large for the road and shows that here. Correct scale dirt is as important as any other part of the model. The key to using dirt is scale. It is so important that the material look right in it’s miniature version. If too large, they make the scene suspect. 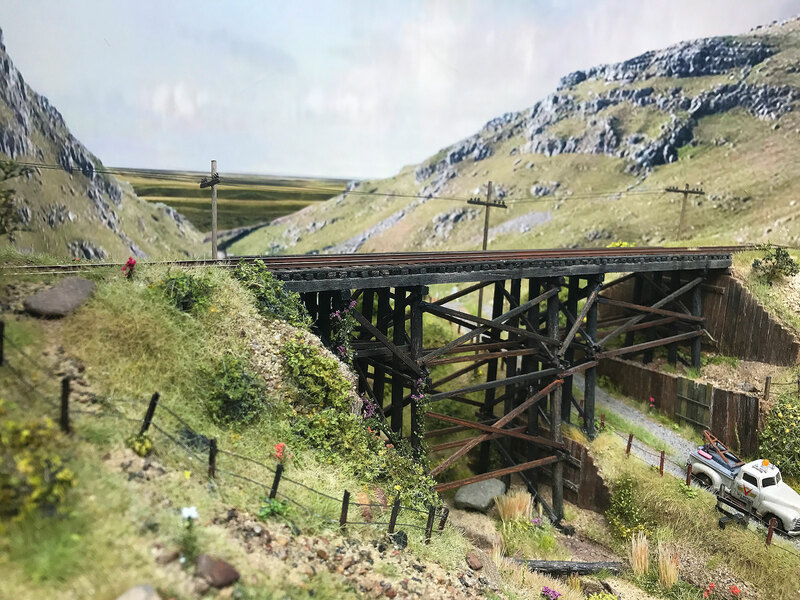 I made a mistake on The Trestle by using commercial track ballast (too uniform in color) for road gravel (much too large for that) and in my opinion ruined the effect. Overall the scene was saved by me doing a better job on the rest of the diorama yet that road still irks me. I had collected some fire-pit ash and I didn’t know what I was going to use it for before I soon realized that it substitutes for a sand-like substance when used in a model. In other words it is so fine a material that it really looks like scale dirt and sand. I had a jar of it and made note of its source so that I could go and get more if needed. One important step before I dumped the dirt on the track was to draw out a plan of how the dirt and grass should be laid out. I used another photo as a rough guide for what I was looking to do. I wanted to at least get four important features as listed in the photo. 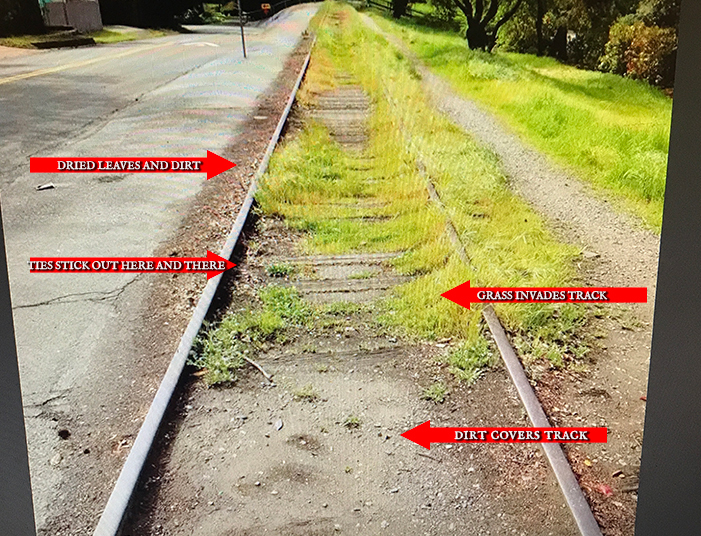 The photo helped me map out a plan of the track. 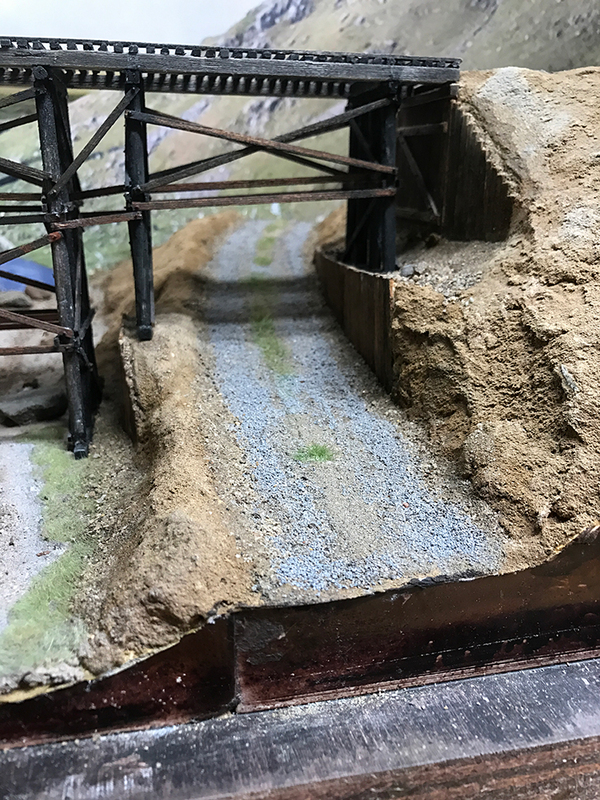 There were going to be lots of small changes and weathering events in a short space and to avoid just dumping dirt randomly the plan allowed me to be much more careful while placing the various elements. Not a great sketch but enough to keep me on course. I added the dirt over the ties, the grass invasion, and made sure plenty of ties were still visible. I was modelling within a space of about three inches in length. So with that done it was time to add some dirt. I wanted to start with the finest grain dirt possible. Dirt at the wrong scale can ruin an effect so for this project I made sure I started with the finest dirt available. 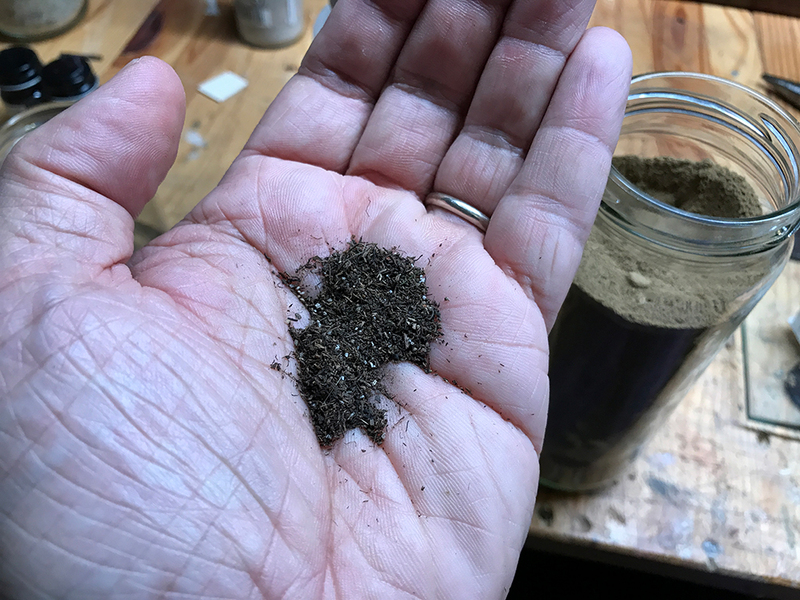 This dirt came from my jar of fire-pit ash. An example of the ash filtered before and after. 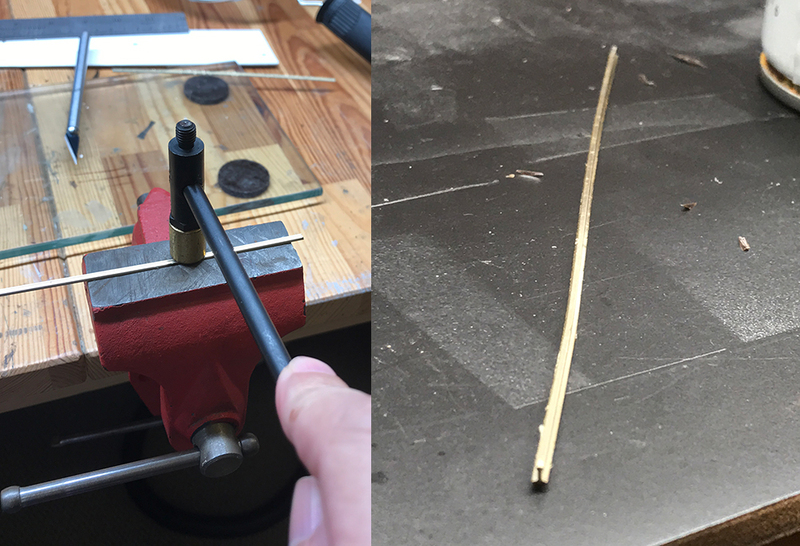 I was able to get an even finer grade than the grade on the right. The finer, the better. I took my time and added the dirt gently. This grade of dirt was not as fine I wanted and later I realized I had used the wrong jar. I added the firepit ash a little later. Not quite as fine as I wanted, nevertheless the dirt is still within a realistic scale. I tried to make sure I kept grains of dirt off the tops of the ties. I used the well-known method of alcohol mist and diluted Mod Podge to secure the dirt. This is just first layer. I let it dry overnight. While waiting for the ground cover to dry I took the rails and bashed them up just a little. 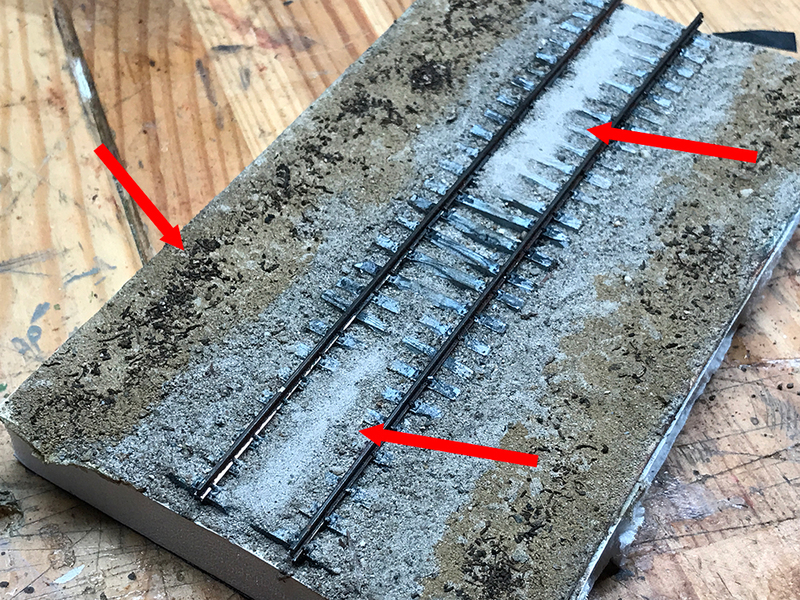 I spread some ash over the rail on top of the (railroad tie brown) paint while it was drying and the once dry I used rust pigment along the rail. The result was a very rusty looking rail. I let the pigment and fix just drip down the rail. 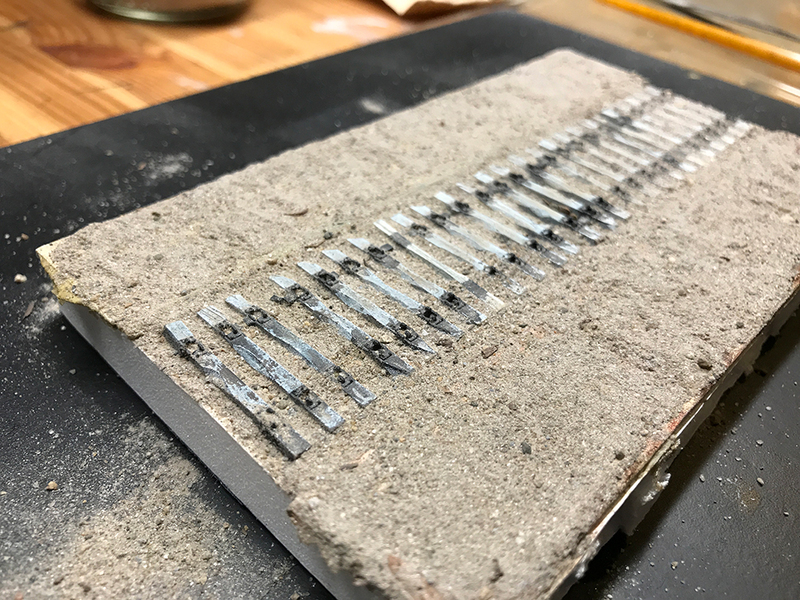 It mixed with ash and created a rust texture on the rail. The dirt dried overnight and once dry I added the first detail: the dirt/sand over the ties in two places. This is the point that I realized that I had been using too large scale dirt. I filtered down my ash and used it in between the track. The first arrow points to the fire ash, the second points to slightly larger grains. The mix of the two makes for a very realistic scene. I have jars and jars of dirt of different colors and textures. I wanted to add more contrast on top of the soil so I grabbed a thimble-full of dirt and spread it around. The scene before vegetation goes down. I worked on it further to tidy things up. It looks bit of a mess right now but once the greenery goes down things look alot cleaner and aesthetically pleasing.